My 2012 gardening resolutions were "sort that crazy situation out" and also "spend as little as humanly possible." This combination of resolutions presented me with an interesting challenge -- we have a lot of empty garden space, especially in our backyard. 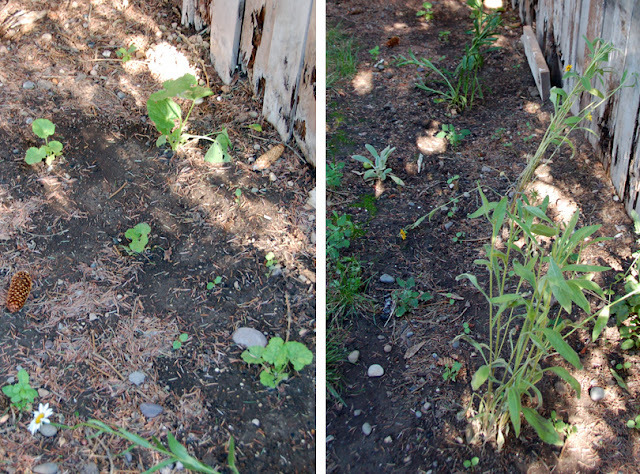 You may or may not remember the failed wildflower seed experiment of 2011 (boo). The obvious solution to this problem was to get free plants from other people! Look at me being resourceful. Once perennials get large enough you can split a lot of them -- and while spring and fall are the best, least stressful times to put your plants through this surgery, my garden waits for nothing because I'm impatient. I'm lucky I have such understanding family members and a father who really knows what he's doing. When I was down at my parents' home for Aidan's birthday this week I convinced my dad that it would be a really good idea to split some of his plants and send them home with me. Because it's midsummer I'm really going to have to baby them for a week or so with lots of water, but we did a pretty good job of keeping root balls intact and some of the plants probably don't even know they've been moved. We also chopped off all the pretty flowers so the plants would spend their energy and resources on growing new root systems instead of wilting because their roots weren't extensive enough to support all the leaves and flowers. Technical stuff -- did I mention I'm glad I have a father who knows what he's doing? So on Wednesday I added probably 20 to 25 new plants into my gardens, a large chunk of which were first year hollyhocks -- I'm too impatient to let the ones I have drop seeds because it takes a couple years for hollyhocks to flower, so I just doubled the first year plants I already had growing to speed the process up a bit in my impatience. And of course because I'm a mind changer all these new plants in my garden meant I needed to move some of my existing plants around. It was a big job, and I'm out there watering a lot right now. Poor plants. 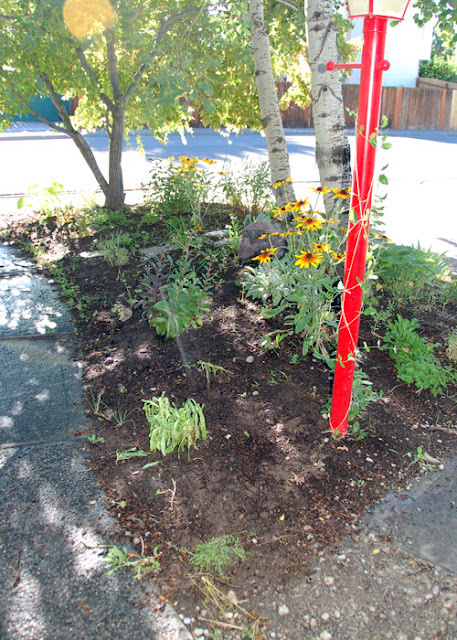 I also moved some "volunteers" around -- baby Lamb's Ear and Russian Sages that have cropped up from my existing garden. For example, I have an ugly little triangle of dirt outside one of my dining room windows where a meter sits, and I moved a Russian Sage there. 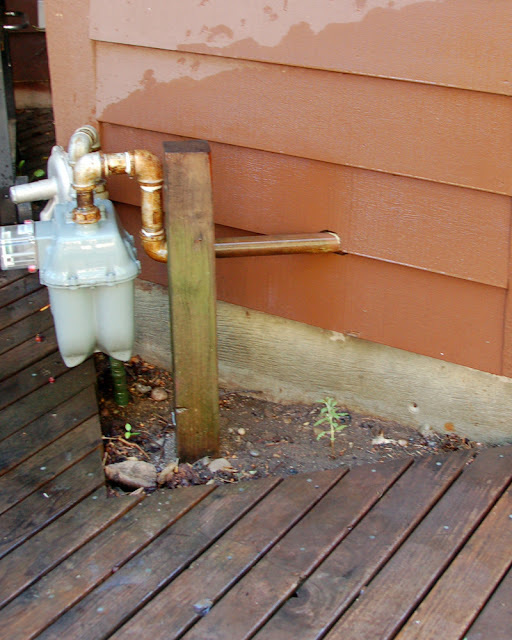 In a year or two it will be large enough to hide the meter and spill over onto the deck and that corner will be fabulous. And I will have flowers! And it will look pretty. I hope. I started following your blog recently and am so glad to see other gardeners posting plant projects! I am working on a "Lily Garden" for my daughter Lily and have brought in lots of plants from family and friends. Luckily my aunt and one friend in particular have crazy amounts of perennials that need splitting, so I am the lucky one to grab as many as possible. My parents have a bunch too, so I'm looking forward to adding more as our garden grows. I need to split my hostas but am waiting 'til a nice fall (and much cooler!) day to do that so I'm not dying, let alone them too! I swear one of my hostas is almost 6 feet around, so that baby needs to be seperated!!! Good luck with your baby plants! :) We've given up on adding new plants this summer as we're in Missouri with some major droughts and heat issues, but we've been watering every day to keep my green babies happy! Anna...you are on your way...sunshine will do wonders! Mwen dakò ak konklizyon ou epi yo pral prese gade pou pi devan pou dènye nouvèl sou tap rantre ou. Jis di mèsi pa pral jis pou apwopriye, pou klè nan bèl bagay nan writing.It ou se enperatif ke nou li Post blog anpil atansyon. Mwen deja fè l ', li jwenn sa a Post se reyèlman etonan.